Why are some of China's happy couples getting divorced? You've heard about happy couples lining up to tie the knot in Las Vegas, but why are some, equally happy ones in Shanghai, queuing to dissolve their unions? According to reports, there has been a surge in married couples filing for divorce in China's most populous city this week. The supposed reason for this may surprise you. It's apparently because they feared missing out on a loophole which makes it easier to buy a second property. Home purchasing rules in China treat married couples as a single unit. At present, a first-time buyer and resident of Shanghai can buy one property with a 30% deposit and 10% discounted interest rate. A married couple can buy up to two properties. The deposit for the second property has to be between 50% and 70%. So by getting a divorce, even if it's just on paper, couples can once again get the more favourable deposit rates enjoyed by individuals. This playing of the system has apparently been happening at a steady rate for years. It's been partially driven by the booming property market in Shanghai, where the purchase of a first home, let alone a second, is beyond the reach of many on average incomes. But the sudden spike in divorce filings was apparently caused by a rumour that Chinese housing authorities were wise to this loophole and keen to shut it down. The most common version of the rumour spread on social media was that from 1 September couples would have to have been divorced for at least 12 months before they could attempt to buy a further property as individuals. Although officials strenuously denied there would be any such rule change this didn't halt the stampede of people seeking to get unspliced before the rumoured restrictions were supposed to be introduced. The Chinese economic magazine Caixin said that that long lines of people were spotted at one Shanghai district's marriage registration centre on 30 August in order to secures their divorces. Other images, like the one below, also appeared on social media sites apparently showing similar queues of would-be divorcees. According to the Shanghai Municipal Real Estate Trading Centre data, by 3.50 pm on 30 August, 1470 new properties were sold. The previous four days had seen an average of 1,000 sold each day - almost double the daily sale record. The last time the daily sale record exceeded 1,000 was on 24 March. At that time, there were similar online rumours insinuating other changes in property regulations. Similarly, Shanghai's Real Estate Transaction Centre said its website crashed on 26 August, for about an hour, due to a surge in web traffic. Peng Jinling, a Shanghai Estate Agent told BBC Trending that he had come across couples getting divorced for financial reasons, even though they planned to stay together. "It's very normal to see people get divorced for the purpose of buying a second property," he said. "The difference between 30% deposit and 50% or even 70% is huge. 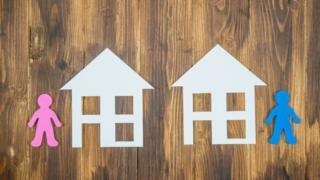 Divorce makes big change when you want to buy another property. I think among those divorced couples, 95% of them remain 'fake' divorces. Maybe 5% end up real divorces." There are certainly anecdotal reports circulating on social media of increased divorce requests. One Civil Affairs Bureau officer (who grants same-day divorce requests) in the Xuhui district of Shanghai put up a notice asking couples to come back the next day. "Over 70 couples came to get divorced, which is beyond the office's processing capacity," the officer explained. Images of other notices from marriage registration offices in different districts was also shared on the Sina Weibo social media platform. On 29 August, the Shanghai government news office's Sina Weibo account announced that the property regulations would stay the same as the most recent changes (which were made on 25th March), and that no new deposit measures had been discussed. The response on media users was mixed. Some people felt the non-appearance of new restrictions on 1 September showed the divorce rush had been foolish. But others remained wary. "Nothing being discussed doesn't mean that there won't be new policy coming up," one user wrote. Another joked: "It is too late now! The divorce has been done." On Sina Weibo a hashtag which translates as 'Shanghai divorce and buying property trend', was shared more than 240,000 times. Some used the tag to argue that cheating the system was immoral. Bierjiang from Shanghai wrote: "Shameful couple! For those who have a fake divorce in order to buy another house. Shameful system! If hundreds of thousands of couples are doing, it means there is problem with whoever developing the policy. Shameful country!" However, others, like a user called lewis617_pkr felt that with housing prices being as high as they are (according to National Bureau of Statistics property prices in Shanghai jumped 27% between July 2015 and July 2016), couples have no choice. "I hope the government can take its responsibility and regulate the house price, otherwise, the local residents lose their confidence and people will continue panic and rush into buying properties," he wrote. NEXT STORY: Cash for catastrophes?